Our “How to Save a Place” toolkit series has guided you through the wilderness of managing your personal expectations during a preservation project, understanding the difference between federal, state, and local preservation groups, and fundraising basics. Today, we’re going to help you navigate through the tricky thicket of historic designations. For professional preservationists, historic designations are among the primary go-to factors to consider when trying to save a historic site or property. However, for people who don’t spend their days steeped in historic preservation, it’s not always easy to determine what separates a national landmark from a local one -- not to mention all the stops in between. These tips will help you better understand the difference between federal, state, and local designations, their benefits, and their application processes. Federal designations include the National Historic Landmarks (NHL) Program and listing on the National Register for Historic Places (NR or National Register). Both the National Historic Landmarks Program and the National Register for Historic Places are managed by the National Park Service. NHLs are places that have the strongest association with a significant event in our nation’s history or that best tells the story of a person who played a significant role in the history of the nation. They are also places that are an exceptional representation of a particular building or engineering method, technique, or building type, and/or have the potential to yield new and innovative information about the past through archeology. It is important to note that NHLs relate stories that are important to the history of the nation as a whole, not just local communities or states. The National Register is the nation’s official list of historic structures. The National Register is the nation’s official list of historic structures, focusing on sites and properties that are more than 50 years old. (Historic places less than 50 years old can be listed on the National Register, but must adhere to special criteria and guidelines.) Despite the “national” moniker, sites listed on the National Register can interpret stories that are important to a local community, the residents of a specific state, or to all Americans. On the state level, historic properties or sites will be listed on a state register, which is managed by that area’s State Historic Preservation Office (SHPO). Criteria for listing a historic place on a state register may vary by state, so contact your State Historic Preservation Officer for specific details. Local communities may choose to put greater protections in place for their historic resources by enacting a preservation ordinance. The ordinance creates a process by which properties may be designated as individual landmarks or as contributing structures within a historic district. A preservation ordinance also establishes a design review board (known as the preservation commission) and process, which are critical for securing historic district designation. Each ordinance is tailored to fit the needs that best suit the individual community. Note: In general, a historic site can have local, state, and federal designations. Both the National Register and NHL offer protections -- in the form of significant legal hurdles -- in the event that federal government work threatens a historic site (when building a highway, for example). They may also make property owners eligible for preservation funds and federal historic tax credits that can help offset the costs of rehabilitation. Moreover, a place’s recognition as a NHL or listing on the National Register generally initiates the process for receiving preservation funding from state and local governments. 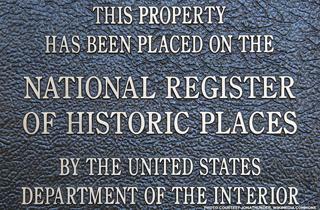 A property or site listed on a state register protects a historic place from state government work. In addition, they are eligible for state funding and for tax benefits and incentives. The review requirements of local preservation ordinances are one of the best forms of legal protection a historic place can have because they protect it from local zoning and development laws. In addition, they give property owners more confidence in the long-term stability of the neighborhood -- which means they’re more likely to make investments in their property to the benefit of the entire community. And last but far from least, they help property owners see themselves not only as owners but as stewards of history. Although the National Park Service manages the NHL and the National Register, each has different application processes. In order for a site to be designated a NHL, the owner, a preservation organization, or interested member of the general public must nominate it to the National Historic Landmarks Program. Then NHL staff reviews the nomination and, if approved, sends it to the Landmarks Committee. Once the Landmark Committee reviews and approves the nomination, they make a recommendation to the Secretary of the Interior. The Secretary of the Interior then considers the recommendations and approves or disapproves the property or site as a National Historic Landmark. Overall, the nomination can take anywhere from two to five years. Note: Remember, if you are not the property owner, it is always a good idea to communicate your preservation interests to the owner, as well as how those interests can benefit them in a variety of ways. Establishing pleasant relationships with owners of historic sites earlier on can help make the designation process smoother later. A property or site contending for a spot on the National Register must be nominated to the State Historic Preservation Office, then reviewed by the state’s National Register Review Board. If approved, the state submits the nomination to the National Park Service for final review by the Keeper of the National Register for Historic Places. The Keeper reviews the nomination and determines within 45 days if the historic site will or will not be listed. At the local level, it is imperative to first review the historic preservation ordinance in the area. It will explain the criteria for a property to be designated as historic, as well as the review process. Because each ordinance is site-specific, it’s difficult to summarize a “one size fits all” process. (See one case study here.) Generally, however, you first initiate an application for historic designations, and then prepare a well-researched argument for the local preservation commission to review at a public hearing, where they will give their recommendations and/or approval for designations. This post was adapted from the toolkits How to Designate a Historic Place in Your Community, Historic Designations: What Do They Mean?, and Build Your National Register Knowledge.